Celtics radio play-by-play man Sean Grande courtside at the TD Garden in 2009. For every broadcaster with whom we associate a singular sport or team — Joe Castiglione and the Red Sox, to name a familiar example — there are many others we hear calling a myriad of events. For instance, Dave O’Brien, Castiglione’s partner on WEEI’s Red Sox broadcasts, also calls major league baseball and men’s and women’s college basketball on ESPN. But if there’s another broadcaster on the local or national scene who is pulling off the same combo as Sean Grande, that person’s identity is a mystery at this address. Grande, the excellent radio play-by-play voice of the Celtics since 2001, recently added a new sport to his repertoire. He took on the role of play-by-play voice for Bellator, the mixed martial arts competition that airs on Spike TV and occasionally on pay-per-view. He made his debut last Friday, and while his résumé has long been varied – he has called 14 NCAA hockey Frozen Fours – the NBA/MMA combo is distinct and perhaps even unique. “I don’t know of anyone who has that NBA/MMA link,’’ said Grande, who debuted last Friday. “That’s part of the appeal of it. It really is about trying something different, taking a chance, and reinventing yourself a little bit. 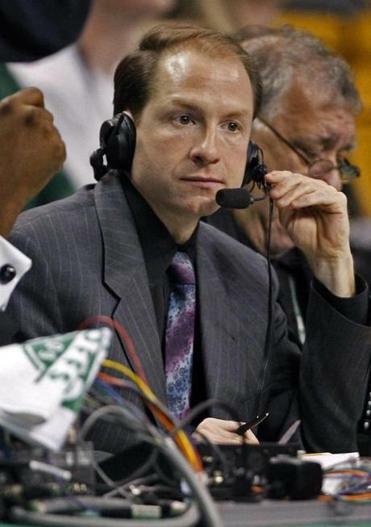 Grande is expected to remain with 98.5 The Sports Hub’s Celtics broadcast team for the foreseeable future. But what Bellator provides is invigorating, in part, he says, because it is a new professional challenge. The sports media parlor game of speculating where Bill Simmons would land after his split with ESPN in May was partially resolved on Wednesday. HBO announced he was joining the no-holds-barred cable channel to host a weekly sports and pop culture talk show beginning in 2016. It seems a natural fit. HBO, unlike ESPN, is liable to encourage and even embolden his sharp salvos aimed at the likes of NFL commissioner Roger Goodell rather than punish Simmons for them, as ESPN was prone to do. Simmons was suspended last September for saying on his podcast that Goodell lied about what he knew regarding the tape of Ravens running back Ray Rice punching out his fiancée in a casino elevator. Simmons dared ESPN to punish him for the comment. The brass accepted the dare and he got a three-week ban. HBO also rewarded Simmons with a production deal to produce documentaries and video podcasts. The deal allows for Simmons to write for another outlet. He built his name and his brand with his writing, and he is certain to draw enormous traffic to wherever he lands. The logical bet is the Bleacher Report, which is produced by Turner Sports and, like HBO, is owned by Time Warner. Josh Maurer, who was recalled by NESN from Pawtucket to fill in for Don Orsillo during the longtime Red Sox television voice’s mandatory week-long vacation, needs more time on the farm before he’s ready for the big leagues. Right now, he’s a little too understated and yet talks a little too much, if those two characteristics in concert actually make sense. Maurer, who also calls UMass football games, may prove to be next in the long and distinguished line of Pawtucket broadcasters who went on to thrive calling major league games. But if NESN has an intention of replacing Orsillo with him any time soon, it would be the broadcast equivalent of replacing Jacoby Ellsbury with a not-ready-for-prime-time Jackie Bradley Jr. for the 2014 season. Orsillo returns Friday night. Hopefully he enjoyed his break more than NESN viewers did . . . As of a week before the All-Star break, NESN was averaging a 5.98 household rating on its Sox broadcasts, which was sixth among regional sports networks that carry Major League Baseball, up 6 percent from a year ago. Pedro Martinez will be enshrined in Cooperstown Sunday — now there’s a can’t-miss speech — and NESN is paying proper acknowledgment with a block of condensed rebroadcasts of his greatest games during his seven (1998-2004) spectacular seasons with the Red Sox. The network will show what it has dubbed “The Best of Pedro” beginning at noon and running until 7:30 p.m. Due to broadcast rights circumstances at the time, NESN’s “Best of Pedro” doesn’t include arguably Pedro’s best game — his one-hit, 17-strikeout performance against the Yankees on September 10, 1999, aired on Ch. 38 . . . The Hall of Fame ceremony will air on the MLB Network, with coverage beginning at noon Sunday and the festivities, including the inductions of Martinez, John Smoltz, Randy Johnson, and Craig Biggio, beginning at 1:30 p.m. . . . The current and last-place Red Sox play the Tigers in ESPN’s Sunday Night Baseball broadcast from Fenway. Dan Shulman, John Kruk, and Curt Schilling will call the game from atop the Green Monster, something the trio also did last August. Fair to suggest they’ll be in no danger of being drilled with any baseballs hit by the home lineup.